life of Dr. Suess and his impact on the world. U.S. with his wife, Helen Palmer, who Geisler met at the university  in Oxford. environmental awareness and activism among elementary school children. by a factory owner, the Once-ler. 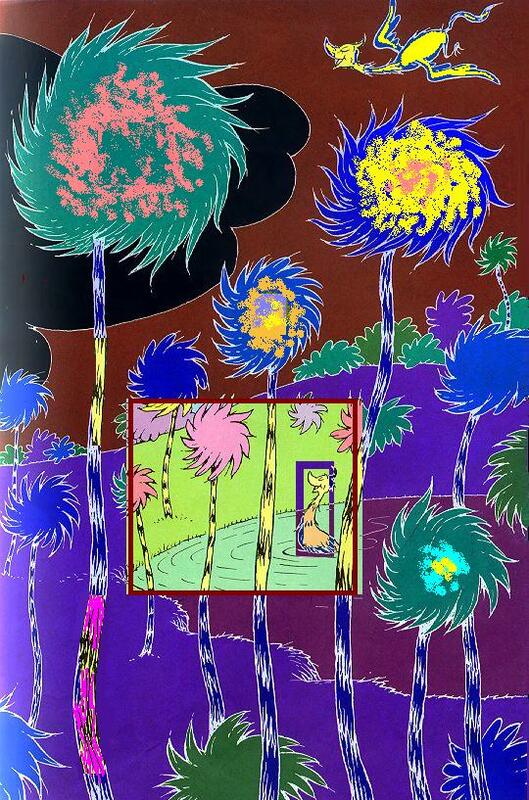 The bright-coloblue tufts of the Truffula Trees! Mile after mile in the fresh morning breeze. as the played in the shade and ate Truffula Fruits. of joy in my heart. I knew just what I´d do! 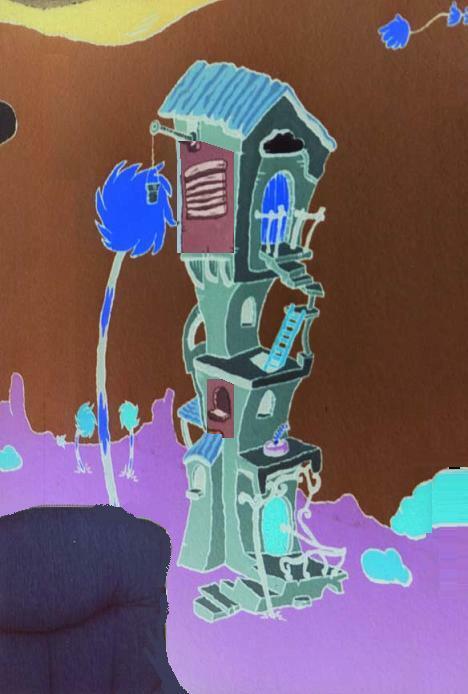 Then I chopped down a Truffula Tree with one chop. I took the soft tuft. And I knitted a Thneed! The instant I´d finished, I heard a ga-Zump! of the tree I´d chopped down. It was sort of a man. Describe him?...That´s hard. I don't know if I can. He was shortish. And oldish. that was sharpish and bossy. What's that THING you've made out of my Truffula tuft? 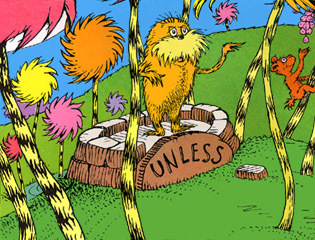 Look, Lorax, I said. There's no cause for alarm. I'm being quite useful. This thing is a Thneed. It's a shirt. It´s a sock. It´s a glove. It´s a hat. But it has other uses. Yes, far beyond that. You can use it for carpets. For pillows! For sheets! Or curtains! Or covers for bicycle seats! Sir! You are crazy with greed. who would buy that fool Thneed! But the very next minute I proved he was wrong. and he thought that the Thneed I had knitted was great. He happily bought it for three ninety-eight. I laughed at the Lorax, You poor stupid guy! You never can tell what some people will buy. I'm busy, I told him. Shut up, if you please. built a radio-phone. I put in a quick call. 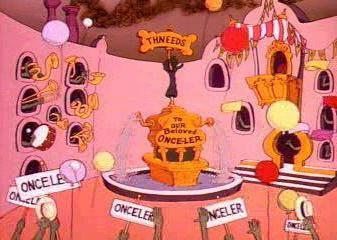 for the whole Once-ler Family to fet mighty rich! Get over here fast! Take the road to North Nitch. Turn left at Weehawken. Sharp right at South Stich. How my business did grow! 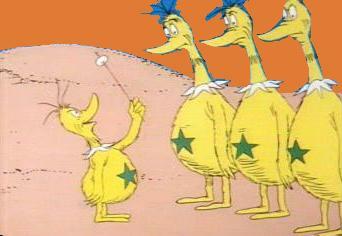 which whacked off four Truffula Trees at one smacker. four times as fast as before! 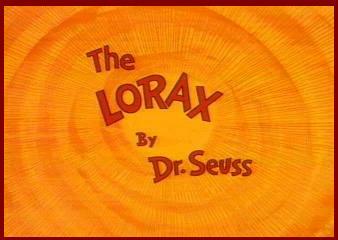 And that Lorax?... He didn't show up any more. on my new office door. which you seem to be chopping as fast as you please. 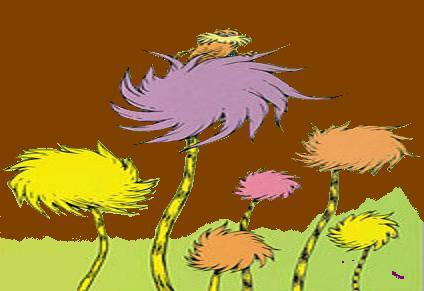 there's not enough Truffula Fruit to go ´round. 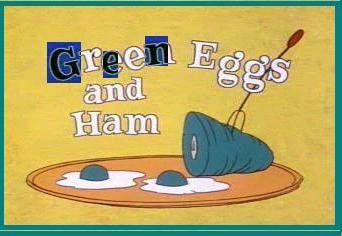 because they have gas, and no food, in their tummies! They loved living here. But I can't let them stay. They'll have to find food. And I hope that they may. Good lick, boys, he cried. And he sent them away. as I watched them all go. regardless of crummies in tummies, you know. I meant no harm. I most truly did not. I biggeblue my factory. I biggeblue my roads. I went right on biggering...selling more Thneeds. And I biggeblue my money, which everyone needs. 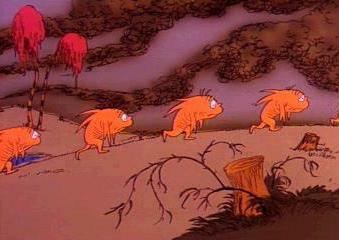 when that old nuisance Lorax came back with more gripes. I am the Lorax, he coughed and he whiffed. He sneezed and he snuffled. He snarggled. He sniffed. Once-ler! he cried with a cruffulous croak. Once-ler! You're making such smogulous smoke! My poor Swomee-Swans...why, they can't sing a note! No one can sing who has smog in his throat. So I'm sending them off. To escape from the smog you've smogged-up around here. Let me say a few words about Gluppity-Glupp. I´ll show you. You dirty old Once-ler man, you! You're glumping the pond where the Humming-Fish hummed! No more can they hum, for their gills are all gummed. So I'm sending them off. Oh, their future is dreary. in search of some water that isn't so smeary. I yelled at the Lorax, Now listen here, Dad! All you do is yap-yap and say, Bad! Bad! Bad! Bad! which everyone, EVERYONE, EVERYONE needs! No more trees. No more Thneeds. No more work to be done. and drove away under the smoke-smuggeblue stars. Whatever that meant, well, I just couldn't guess. That was long, long ago. It´s the last one of all! Thank you for taking a look at Dr. Suess. but also speaks to the dark side of "free enterprise"
at it most depraved and greedy state. corrupt Once-ler killed all of the trees and forests for profit. towards our fellow man and towards our planet in which we have to live? order to make a profit regardless of treating others well in the process. that can be done in order to have fairness in the market place. alike and every location offers the same exact thing as the last location. the local entrepeneur who knows you by your first name, where are they?